Why is an EMV Chip Enabled card reader important for a merchant to accept credit card payments? As you may already know, by October 2015, retail merchants are required to use EMV chip enabled credit card readers to process credit card / debit card transaction to avoid the responsibility of credit card fraud. There are an estimated $1.24 billion credit cards, and 15.4 million POS terminals currently in use. The new credit card processing standard is called EMV (Europay, MasterCard, and Visa) for a more secure way of accepting payments in a card-present environment. An EMV Smart Card Reader or EMV chip enabled POS terminal will communicate with the chip inside the customer’s credit card to determine whether the card is authentic. The reader or POS terminal will prompt the customer to sign or enter a PIN to validate their identity. This process effectively prevents the possibility to process a counterfeit card or be held liable for a fraud-related charge back (read more about our chargeback prevention service) from your credit card processor. What's the deadline of switching to EMV enabled smart reader? By October 2015, merchants will be liable for counterfeit & credit card fraud on transactions not equipped for EMV technology. Gas stations have until October 2017. In addition to being liable to the fraudulent transaction, merchants that neglect to be EMV compatible run the risk of damaging their company reputation and facing fines. The merchant will also face a high possibility of having their merchant account closed and then being rejected when applying for a new merchant account. How to get a free EMV chip enabled smart card reader? You can always pay $300 - $1,000 dollars for a smart card reader or POS terminal, OR you can contact us about getting an EMV card reader at no cost, through our terminal placement program. Please contact us for details. Some restrictions may apply. Limited Time Offer and Quantity is Limited. What businesses are most likely to fall victim to receiving counterfeit card fraud? Counterfeit card fraud transaction are mostly like to happen when a card was stolen or duplicated into a fake card. The fake credit card is then used at gas stations or stores for a small charge to see if it works. Once the small charge goes through, the card will then be used to pay for higher price tag items or to pay for something that is NOT refundable. The following businesses are most likely to fall victim of counterfeit card fraud transactions. Although Moneck.com offers optional chargeback prevention service, the credit card issuing bank can reject your request to reverse a chargeback without EMV. So having an EMV card reader is a must have to help eliminate your risk and exposure to negative outcomes. 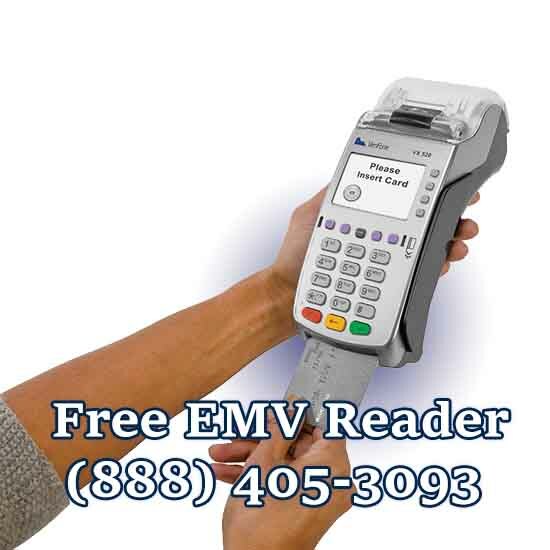 The good news is that we make it easy and affordable for your business to accept EMV Chip Card Transactions.